As I noted in a recent post [A kitchen accident, November 13], I discovered that my short-term memory is even less reliable than I had assumed. The accident, which ended up destroying a large Pyrex lid, was recalled by Paula and me in very different ways. In my version, it was Paula who discovered the red-hot burner, turned it off, and poked the Pyrex top with a dinner knife, causing the top to disintegrate. But Paula was not even in the room at that time. She had helped out with the peeling and cutting of a small pumpkin, the central ingredient in our dinner, then left the room to attend to other matters. The glass lid had shattered in the kitchen sink when I apparently immersed it in cold water. When Paula proofread the blog post a couple days later, her reaction to my memory of events was halfway between amusement and horror. The most charitable interpretation is that a prosecuting attorney might want to think twice about calling me to testify–unless his intent was to mislead the defense. One of the odd things about Alzheimer’s is that someone can have a piss-poor short-term memory and still write as well as ever, though at a slower pace. This is less surprising in my case, since I’m still at an early stage of the disease. But the book I recently read by Greg O'Brien, On Pluto: Inside the Mind of Alzheimer’s, is a revelation and an inspiration. The revelation is that as this illness follows its meandering path, some people are able to tap into what is called “cognitive reserve” – the ability to maintain core professional and vocational competencies. In O’Brien’s case–and in mine–that core competency is writing. This can be true deep into the middle stage of the disease when certain everyday activities become challenges, if not adventures. O’Brien describes an unsettling trip through an automated car wash and, in the same afternoon, his decision to use his lawn tractor in the Cape Cod town of Brewster not only to mow his own land but also the properties of his neighbors. The confusion didn’t end there. I quoted this lengthy passage for two reasons. The first is that it’s an example of vibrant prose. Everything is vividly specific—the types of sapling trees, “the piercing grinding” of the mower, the old man fleeing to the shelter of his house. The explanation for this disconnect—lucid prose on the one hand, dementia on the other–can be described as a kind of mental bank account, or tank of gas, that allows some people to continue to function at a high level in certain realms, even when short-term memory and executive functions are deeply compromised. What a strange, vaguely comic disease I have. 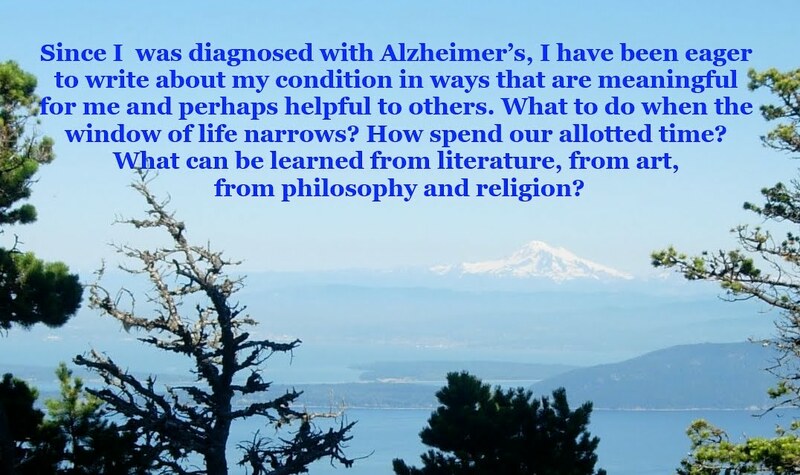 Soon after I announced on Facebook this past summer that I’d been diagnosed with early-onset Alzheimer’s, I heard from Steve DeWitt, who, in the late 1970s, was one year ahead of me at Sehome High School in Bellingham, Washington. Steve, it turned out, also was ahead of me in being diagnosed with this disease. Each of us played on our football team. Like many of us at a very early stage in the disease, Steve was not ready to acknowledge that the problem was his. He continued to bid for contracting jobs. Steve added, “I was stubborn then. I kept on thinking that it was everyone else’s problem, not mine. During our conversation, Steve and I swapped stories of the fear we faced being sophomores on our high school football team and having to scrimmage against the varsity. Many of the seniors were grown men. Steve recalled getting hit helmet-to-helmet by Lance Neubauer, a huge specimen of a man who looked like a living version of Michaelangelo’s statue David, but with larger thighs. Neither Steve nor I are aware of any instances of early-onset Alzheimer’s in our extended families. Both of us believe that our cognitive difficulties are at least partly a consequence of playing football. Steve has been examined by two neurologists, but neither is confident that the hit by Neubauer led decades later to Alzheimer’s. (One doctor was skeptical. The other ruled it out entirely.) Another factor in Steve’s health is a work-related concussion in 1988. Because of a seizure some years back, believed to be connected to Alzheimer’s, Steve no longer drives. Living about 25 miles west of San Francisco, he feels isolated at times. But he is active in his local Alzheimer’s support group, and he is also enrolled in a clinical trial about ten miles from his home. At fifty-four, he is the youngest person in the study. The others are in their sixties and seventies. But there is an encouraging sign: The trial medication appears to be helping. I also asked Steve a question about surviving into the terminal stage of dementia, by which time our faculties may be severely compromised.